Upon the suggestion of Big Jim at BarCamp Orlando, we went to Dan's Midnight Pizza in Downtown Orlando near Wall Street Plaza. This will be the first and last time I listen to Big Jim! 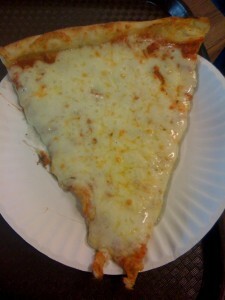 Dan's Sandwich Shoppes (midnight pizza) is located on 28 S. Orlando Ave in Downtown Orlando. 407.425.8881. This place is not a place I will try again. Big Jim mentioned this place was a favorite of night owls who get hungry after being in clubs all night. He did inform me that this pizza was very cheesy. When I got to the counter it looked disgustingly cheesy, but figured I would take the risk, instead of having my readers find out for themselves one day. The guy at the counter barely spoke English, and everytime I said something he yelled at the other guy (I think Arabic) and they both looked and laughed at me, like I was the idiot for speaking English and asking questions. After getting my pizza and sitting down, I couldn't believe how awful it was. The cheese fell out everywhere, and the crust was so soggy and weighted down from the excessive bad tasting cheese they use that I could barely pick it up, even folded. When I lifted up the cheese, I looked at what little sauce they used and it looked gross. Ended up wiping it all off with a napkin. Anyways, I didn't end up finishing my two slices. Wouldn't recommend this place to anyone, even if they are drunk and about to pass out. Gino's Pizza is right down the block and it is delicious! That is where you should go. Dan's Midnight Pizza gets 1 out of 8 slices.